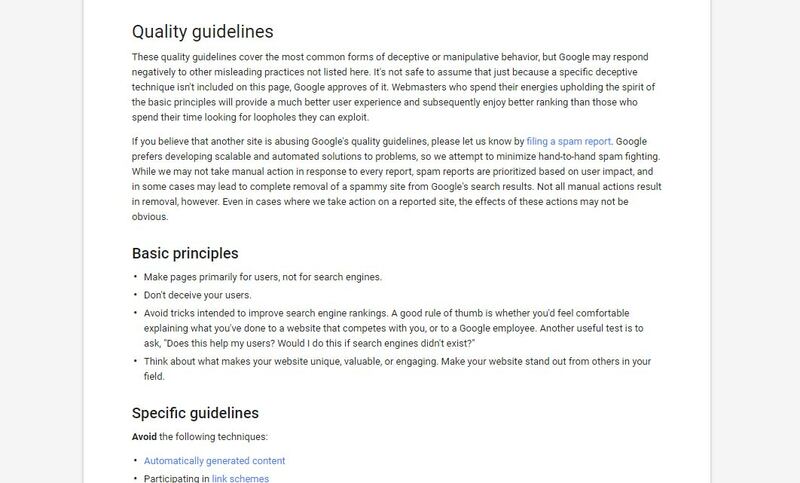 Google guidelines for SEO. Business tips by Kaydee Web. A website can be well designed and pleasing on the eye but hardly ranked at all on Google’s search result pages. Websites owners must abide to certain techniques that appease Google. Techniques that increase chances of a high ranking website. I cover Google’s quality guidelines to give your website a head start. The pages should be primarily for users, not for search engines. Help your users, do not write for search engines. Do not deceive your users. Avoid ‘tricks’ intended to improve search engine rankings. Make your website stand out from others in your field. Website menus (or navigation systems) are sometimes programmed in such ways that links are hidden from search bots – software that crawls websites on behalf of search engines, to collect information and rank them. Search bots then can’t follow navigational links and assumes that the website is made up of just one page. This is often why Google ranks just the home page, and doesn’t list the rest of the site. To make it easy for bots to crawl your website make your navigation system intelligible to search engine crawlers. Navigation systems must be clear, consistent and simple. Organise your navigation system logically – hierarchies help search bots to decipher information within sections of the website. Always link text on internal pages to other pages and articles within the website. This helps the bot to crawl through the site, finding relevant information. Pages inherit rank merit from pages that link to them. Too many links, however, on one page gives the impression that the site is an illegitimate site, one that uses black hat tactics to get ranked. A page with lots of links will receive a high spam score. When a page, or domain, has a high spam score the website may not be ranked at all. So do be careful about the number of links. Websites that have very poor content will never be ranked well on search engine, given that Google wants to supply its users with the best search results. Each and every web page or article on your domain should be useful to your visitors. Think about the words users type to find your pages. Your site must include those words within its pages. Dedicate each page to one search term. Text should be used, instead of images to display important names, content, or links. If images are used use the “ALT” attribute to include a few words of descriptive text. Be cautious of dynamic pages – those on a database system (i.e., the URL contains a “?” character). Be aware that not every search engine spider crawls dynamic pages. A site map can be helpful to users, Include links that point to important parts of your site. If the site map has an extremely large number of links, break the site map down into multiple pages. Search engines cannot visually see images/graphics. They need to be informed what the image is. Named correctly images on your website can be listed in Googles’ Image search too, which is great for your sites rankings. The actual file name can give the Google bot clues about the image subject matter. I always make the file name a sort of description of the image. A product image should be saved as <purple-polka-dot-wellingtons.jpg> rather than Image2.JPG. That way the name is more descriptive to Google. Image file names may be used in search results. ALT tags are short descriptions in the code of your web site. They give bots information about the image. They provide Google with useful information about the image. They are used to determine the best image to display when a user makes a search. Those with visual impairments, or people using screen readers or who have low-bandwidth connections may not be able to see images on web pages. Descriptive alt tags provides these users with important information. If you are using Internet Explorer you should be able to see the ALT tags by hovering over your image. Google Chrome and Mozilla Firefox do not display ALT tags when you hover over images. Good, descriptive titles and captions on all your images will help your organic ranking. Hiding text or links in your web content may mean that Google perceives your site as untrustworthy. This is because you could be presenting false information. Google may completely remove you from it’s index if your site is found to be deceptive. Do be aware that you can over fill pages with keywords, known as keyword stuffing. This sort of behaviour can also be seen as spamming, and Google will return a negative result on your site. Keyword stuffing can harm your ranking, or you could be taken off the results page all together. Focus on creating useful, information-rich content that uses good keywords, in context. View your website in a text browser such as Lynx – this is how search engines would see your website.